Mensusa https://www.mensusa.com/articles/amazing-variety-of-velvet-blazer-created-for-stylish-men.html Amazing Variety of Velvet Blazer Created For Stylish Men When it is celebration time, then there is nothing better than a velvet blazer that are available in a variety of colors and designs. 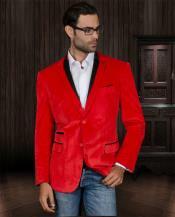 You can choose from the blue velvet blazer or go for the stunning red velvet blazer to rock the party. Blazers are unique ensembles that enhance your looks even when you are not decked up in a costly designer suit. Various types of fabrics are used to create wonderful blazers. Among them, velvet blazer has become the favorite of trendsetters. The variety and the shades that you get in mens velvet blazers is simply amazing. If you visit MensUSA you will be at a loss as to which one is the best. Moreover, the feel and the shine of velvet makes these blazers all the more attractive and makes the wearer look more glamorous. The various designs and features of a velvet blazer and the durability of the fabric have made them so popular among style conscious men of today. When you wear a well fitted blazer, it embraces your body well to give you a handsome look. 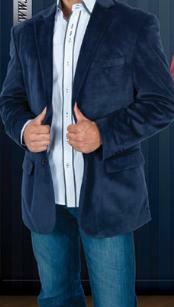 But when it is a blue velvet blazer, it gives you an extra edge over others wherever you go. Blue jackets and suits are the common wares of most men. But when you adorn yourself in a dark blue or a navy blue velvet blazer, you naturally become the center of attraction in a gathering. It may be a wedding or a party, your blue velvet blazer helps to create a style statement of your own. The designs of the blue velvet blazer are created by well-known designers who take great care to make every blazer unique and outstanding. The purple velvet blazer adds a royal touch to your entire look. For parties and weddings, it is the perfect choice when you want to show off your personality and style preferences. The purple color is very gorgeous as well as soothing and so anyone can wear it with matching accessories. 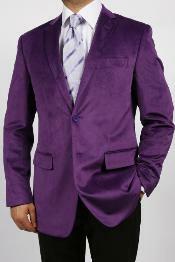 However, it is important to pick the right types of ensembles to match your purple velvet blazer. It offers a luxurious and royal look and if you purchase it from MensUSA you can rest assured that it is the trendiest blazer that you can buy. The fit must be perfect to make you look handsome and smart. You can customize your blazer at the store to get the accurate fit. A velvet blazer is often worn to show off your style and sophistication. There are some men who always wish to go out for more and achieve a new look that is away from the traditional style. Such men will look really awesome in a red velvet blazer. It is so unique and exclusive that it will naturally turn the heads of all whenever you sport it. The texture and the tone of the red color is so vibrant that it makes the wearer look extravagant and grand. Moreover, it offers a bold statement and portrays the wearer's strong personality to go beyond the set rules. A red velvet blazer is never out of style and the variety of designs and cuts available at MensUSA makes it all the more unique and extraordinary.